Notes And Updates: The FuseSwitch is now known as the RVing FuseSwitch™ and is available on our website under the Products Tab . The Protect-A-Tow is available online. We market the Blue Ox Kargard II which is a similar product. Any of these products are not recommended if the coach as a rear exhaust pipe since the heat generated will damage the material used. Do you own a car or SUV that requires the removal of one or two fuses to allow you to tow that vehicle without draining the battery? If you do then our firm has recently introduced a new product that is made for you. It is the FuseSwitch. Simply mount it in a location near the fuse panel and plug the wires from the switch into the fuse panel where the fuse was removed. In the line between the fuse panel and the switch is a fuse holder designed to carry the same amperage fuse as was removed from the fuse panel. In operation all you need to do is flip the switch to the "Off" position. When you want to resume the use of the car again, simply turn on the switch and the affected circuits are activated again. There are two versions: one for single fuse circuits and another designed for two fuse circuits. 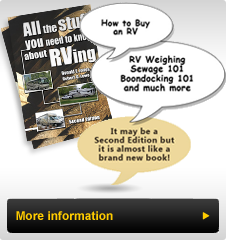 Check out the RVing FuseSwitchTM page on our website for pictures and pricing. At a recent trade show I noticed a product that is similar to one I have seen in the past but is better in many ways. If you tow a car or truck you have been faced with deciding how to protect the towed vehicle from stones and road debris thrown up by the RV. Many have attempted to use a "grass skirt" others have tried the "solid rubber guards" and others have gone with the car protector that covers the over tow car from lower bumper to top of windshield and others have utilized the solid shields that attach to the hitch and stand up in front of the towed vehicle. All of these have disadvantages from lack of effectiveness to cumbersome attachment and storage. The Protect-a-Tow is a specially made durable PVC coated polyester mesh that is connected to the Motorhome and the towed vehicle under the towbar. It protects the wiring, cables, towbar and the towed vehicle. A special lightweight PVC anti-drag bar goes over the towbar to support the material and hold it up off the ground when cornering. The complete packages folds up and is stowed in an included storage pouch. For diesel owners a special shield is available to protect the material from the hot exhaust gases. This material does not unravel if cut or damaged and the complete edge contains a stretch cord so one model fits all Motorhome widths and all sizes of tow cars. Check out our features pages on our website for pictures and pricing. All new inventions or improvements on existing products are the result of questions and suggestions. Do you have an idea? Can you describe it well? Why not send your idea to us and let's see if we can build it or provide a solution to your problem. You can send us an email by going to our website and click on contact us.